2018 Houston 250cc Supercross Results: The Houston Supercross had the type of track that would jump up and bite you if you weren’t careful. 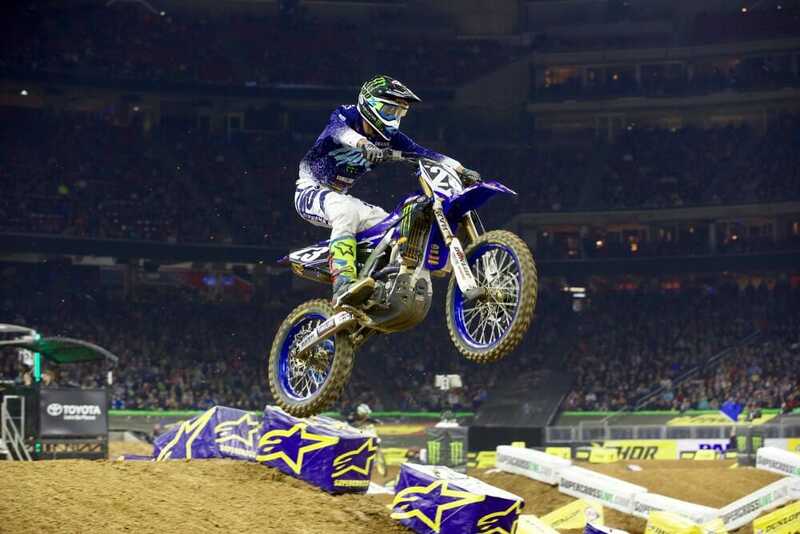 And that’s exactly the kind of track that Monster Energy/Yamalube/Star Racing Yamaha’s Aaron Plessinger likes. 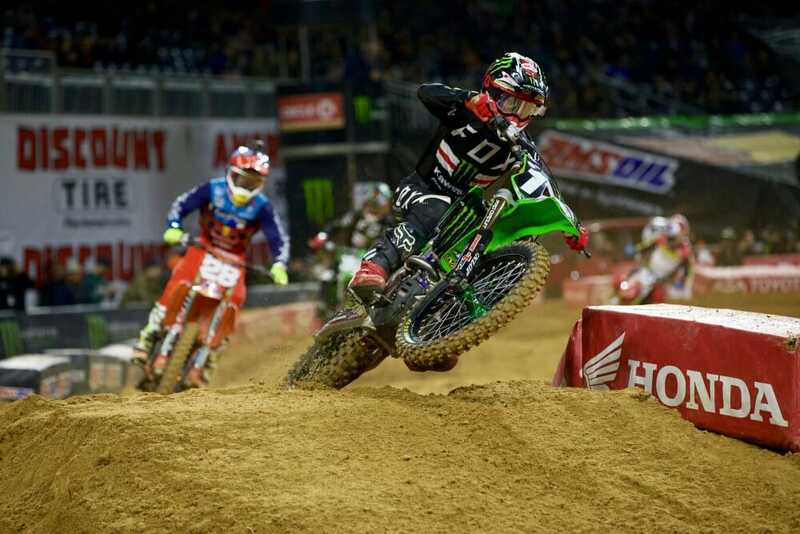 The long-legged racer from a famous off-road background thrives in the tricky ruts of the softer supercross tracks, and in Houston, he absolutely dominated the 250cc main event from behind. He started well outside the top 10, rounded lap one in 10th, but still managed to work his way through the field to collect his first win of 2018. Plessinger had to chase down Monster Energy/Pro Circuit Kawasaki’s Joey Savatgy, who grabbed the holeshot and was forced to fight off the advances of teammate Adam Cianciarulo and round-one winner Shane McElrath before he finally gave up the lead to Plessinger with six laps left in the 18-lap main event. 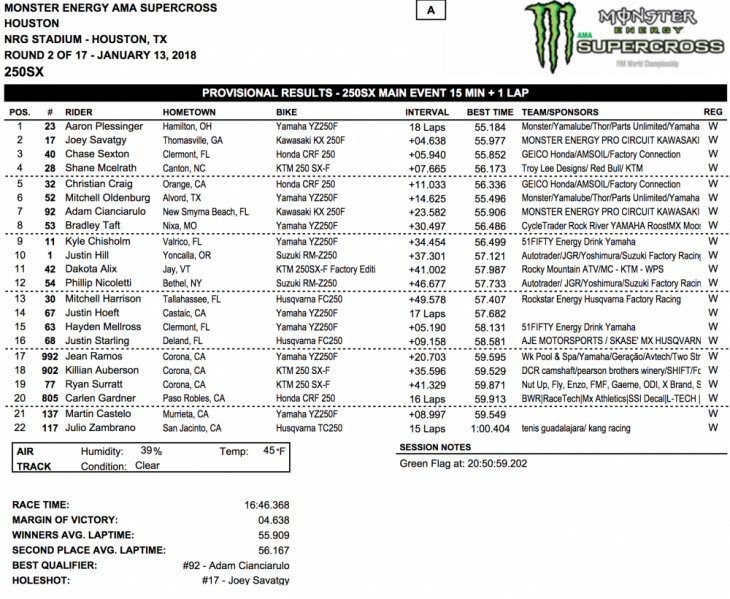 Savatgy hung on for second, just over a second in front of GEICO Honda rookie Chase Sexton, who came on strong in the final laps to go by his teammate Christian Craig, McElrath, and Ciancairulo (who fell at least twice in the main event and ended up seventh). McElrath hung on for fourth in front of Craig, Plessinger’s teammate Mitchell Oldenburg, Cianciarulo, CycleTrader/Rock River Yamaha’s Bradley Taft, 51-Fifty Yamaha’s Kyle Chisholm, and defending champion Justin Hill on his AutoTrader/JGR Suzuki coming home 10th. 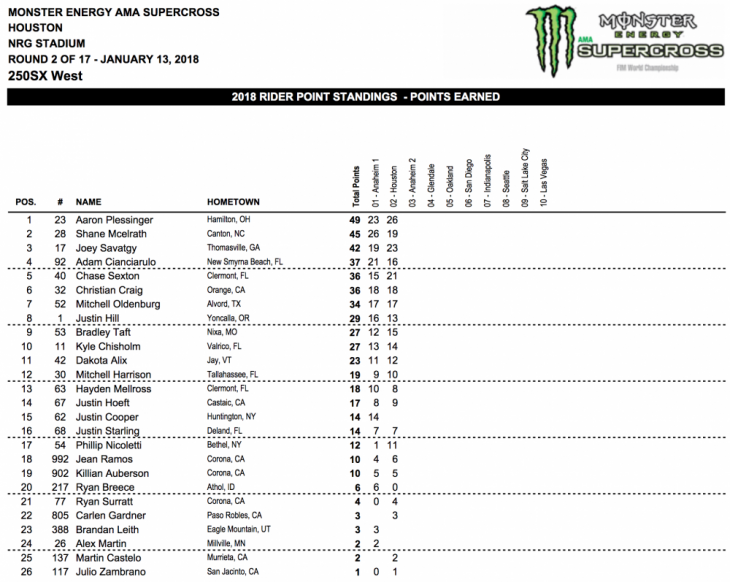 With his win, Plessinger now leads the championship points standings as the series heads back to Anaheim for the first of three Triple Crown events this coming Saturday night.